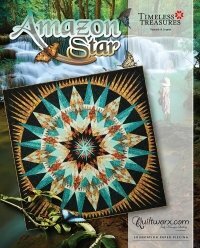 HOME > Judy Niemeyer Quiltworx > Amazon Star Pattern 2016 Update 104" x 104"
Amazon Star Pattern 2016 Update 104" x 104"
Amazon Star Pattern 2016 Update 104" x 104" - The new pattern, while more expensive, includes full Template Layout Sheets allowing for layers of (8) pieces of fabric, floating points, her latest strip-piecing technique for lone star construction, smart corners, and also uses less fabric than the original design. This king size quilt comes in at less than 20 Yards of fabric! The cutting instructions will save you hours of time, assembly is more accurate with smart corners, and the updated instructions clarify many of the areas where quilters have struggled with the original pattern. We hope that the updates will be ones many people appreciate with the overall changes being ones that make this quilt easier to make for future quilters.